Slytherin is one of the four Houses at Hogwarts School of Witchcraft and Wizardry. Founded by Salazar Slytherin, the house is composed mostly of pure-blood students, due to its founder's mistrust of Muggle-borns. The house is traditionally home to students who exhibit such traits as cunning, resourcefulness, and ambition. Its emblematic animal is a snake and its colours are green and silver. The house ghost is the Bloody Baron. 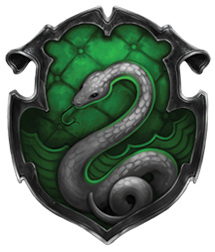 Slytherin corresponds roughly with the element of water with serpents being commonly associated with the sea and lochs in western European mythology as well as serpents being physically fluid and flexible animals. The colours also correspond with waters around lakes and lochs often being green, and silver being often associated with grey rain water. Slytherins tend to be ambitious, shrewd, cunning, strong leaders, and achievement-oriented. They also have highly developed senses of self-preservation. This means that Slytherins tend to hesitate before acting, so as to weigh all possible outcomes before deciding exactly what should be done. According to Albus Dumbledore, the qualities which Salazar valued in the students he chose included cleverness, resourcefulness, determination, and "a certain disregard for the rules." Dumbledore noted that all of these were qualities possessed by Harry Potter, who was in Gryffindor. The Sorting Hat claims that blood purity, is a factor in selecting Slytherins. This suggests that it bases its decisions more upon the views of its members than on any accurate test of a student's lineage. Muggle-born Slytherins exist, but are very rare, as noted insultingly by Scabior the Snatcher. There have also been definite examples of half-bloods sorted into the house, including Tom Marvolo Riddle and Severus Snape. Harry Potter was nearly sorted into Slytherin, but ended up in Gryffindor instead. Also, pure-bloods are not automatically placed in Slytherin. There have been various examples of pure-bloods sorted into other houses, including the Weasley family, Sirius Black, Neville Longbottom, and James Potter I all being sorted into Gryffindor house, Ernie Macmillan being sorted into Hufflepuff, and Morag MacDougal and Stephen Cornfoot being sorted into Ravenclaw. Contrary to the wishes of the other founders of Hogwarts School of Witchcraft and Wizardry, Salazar Slytherin wanted a stricter policy of admission to the school —one limited strictly to pure-blood students. The controversy this created apparently led to him leaving the school and the Chamber of Secrets behind. A millennium later, the house's students are still considered affiliated with Salazar's reputed views, and open expression of pro-blood purity sentiment does seem to be more common in Slytherin than in other Houses. This disagreement over blood purity, which caused Salazar Slytherin's friendship with Godric Gryffindor to break, is the origin of the feud between Slytherin and Gryffindor, the two most competitive of the houses. Slytherin and Gryffindor are generally rivals in Quidditch and for the House Cup, which the former had won seven years in a row prior to Harry Potter's arrival at Hogwarts in 1991. It is also rare for Slytherin and Gryffindor students to be friendly with one another, and common for them to share animosity. This was particularly the case during the First and Second Wizarding Wars. During the latter conflict, no Slytherin students joined an association known as Dumbledore's Army; however, this could be explained by the fact that only those Hermione Granger, Ron Weasley, and Harry Potter trusted were invited. Some Slytherins declined to defend their school in the Battle of Hogwarts, with some joining the Death Eaters. However, there are exceptions, such as Slytherin Severus Snape and Gryffindor Lily Evans, who were best friends until Snape's use of the slur "Mudblood" and his aspirations to be a Death Eater caused Lily to sever their ties. It is said that all Dark Wizards were in Slytherin (though it is untrue, as Peter Pettigrew was a Gryffindor and Quirinus Quirrell was a Ravenclaw), though how many were from this house before Tom Marvolo Riddle began recruiting Death Eaters there is unstated. As Slytherin was his own House, it was certainly most easy for him to recruit there. It might also be possible (though unlikely) that the Sorting Hat simply sorts anyone with ill intentions into Slytherin, regardless of whether they possess cunning and ambition. Vincent Crabbe and Gregory Goyle were both incredibly stupid and did not have clever, cunning minds, but were still sorted into Slytherin. Though it does appear that perhaps they had more of the minor Slytherin traits, since the cowardly Peter Pettigrew was obviously not brought into Gryffindor by bravery, but by chivalry instead. It is also likely that Crabbe and Goyle were simply placed there by process of elimination, since they exhibited virtually none of the qualities valued by any of the other houses (lacking the work ethic or honesty of Hufflepuff, the academic prowess of Ravenclaw, or the bravery of Gryffindor). However, it must be noted that Slytherins who oppose use of the Dark Arts and discrimination based on blood purity do exist, such as Horace Slughorn and Andromeda Tonks; the latter was related to many different Dark wizards and witches (most notably her sister Bellatrix Lestrange, her brother-in-law Lucius Malfoy, and her nephew Draco Malfoy), but chose to forsake the loyalty to her family in marrying the Muggle-born Ted Tonks. Also, the allegiance of Severus Snape was found to be ultimately towards Albus Dumbledore, serving as a triple agent for the Order of the Phoenix. Furthermore, there have been Dark wizards from other houses; Peter Pettigrew, who betrayed James and Lily Potter to Voldemort, was a Gryffindor. Cunning and ambition are easily turned towards ill purposes, but are not inherently negative; furthermore, daring, intelligence, and loyalty can as easily become negative. A reason Slytherins may be thought less of by people is perhaps because many of them seem to value their own lives more than the lives of others. When Harry was trying to run away, because he was afraid that his presence was putting his friends in danger, Phineas Nigellus saw him and said, "We Slytherins are brave, yes, but not stupid. For instance, when given the choice, we will always choose to save our own necks". There are exceptions to this rule however, such as Snape, who Harry said was a "Slytherin and... probably the bravest man I ever knew", and Regulus Black, who gave his life in an attempt to destroy one of the Horcruxes of Lord Voldemort. The truth is that while most Dark wizards are Slytherins, many members of Slytherin House do not have Dark leanings, and smaller groups of Voldemort 's supporters are aligned with other Houses. During the Battle of Hogwarts, while all of the Slytherin students left the school before the fighting started, several of them did return with Professor Slughorn and the Hogsmeade reinforcements to join the fight against Voldemort and his Death Eaters; furthermore, it should be noted that the acting head at the time ordered the entire house to leave due to a single Slytherin student suggesting the student body hand Harry Potter to Voldemort (although none of the Slytherins present moved to defend Harry from the suggestion, as the other three houses did). The Slytherin common room is found in the dungeons of Hogwarts Castle, and is located underneath the Black Lake. Because of its location, the light in the common room is green. Harry Potter along with Ron Weasley entered the common room in his second year to find out if Draco Malfoy was the one opening the Chamber of Secrets. To enter the Slytherin common room one must merely speak aloud the current password in front of a stretch of damp stone wall; once the word is uttered a concealed stone door will slide aside leaving a rectangular hole in the wall leading to the Slytherin commonroom. The only known slytherin password is pureblood, used in 1992. Slytherin's head of house for Harry's first six years of school was Severus Snape; however, as he fled with the Death Eaters in 1997, Potions master Horace Slughorn became the head of Slytherin House. Upon Snape's return as Headmaster later that year, he apparently approved of Slughorn's appointment, or at least did not assign any Death Eaters as a new head of house. The Bloody Baron Founder's time Later became the house ghost. Merlin Medieval era Member of King Arthur's court, advocate of Muggle rights, and arguably the most famous wizard in history. Elizabeth Burke Unknown Has her portrait hanging at Hogwarts, and tells Slytherins to be "Nasty to Mudbloods". Phineas Nigellus Black 1858 - 1865 In later years he was a Headmaster, his portrait hangs in the Headmaster's office. Horace Slughorn Unknown Later became Potions teacher and Head of Slytherin. Tom Marvolo Riddle/Lord Voldemort 1938 - 1945 Later became the most powerful Dark Wizard in history. Finally defeated by Harry Potter during the Battle of Hogwarts. Avery Later became one of the first Death Eaters. Dolores Umbridge Unknown Later became Senior Undersecretary to the Minister for Magic, Defence Against the Dark Arts Professor, Hogwarts High Inquisitor, Headmistress of Hogwarts (1996), and Head of the Muggle-Born Registration Commission. Imprisoned for her crimes against Muggle-borns. Rodolphus Lestrange 1960s Later became a very loyal Death Eater. Bellatrix Lestrange née Black 1962 - 1969  Later became one of Lord Voldemort's most loyal Death Eaters. Killed by Molly Weasley during the Battle of Hogwarts. Lucius Malfoy 1965 - 1972 Prefect; later became a Death Eater (defected). Evan Rosier 1960s or 1970s Became a Death Eater. Killed by Alastor Moody. Rabastan Lestrange Later became a very loyal Death Eater. Avery Later became a Death Eater. Severus Snape 1971 - 1978 Became Death Eater, but defected to the Order of the Phoenix; later Potions master and Head of Slytherin, and became Headmaster for one year. Killed by Lord Voldemort during the Battle of Hogwarts. Regulus Black 1972 - 1979 Became Death Eater but defected and gave his life in an attempt to destroy one of the Horcruxes. Gemma Farley 1980s and 1990s A Prefect. Marcus Flint 1986 - 1994 Captain and Chaser of the Slytherin Quidditch team and he repeated a year. Lucian Bole 1988 - 1995 Beater for the Slytherin Quidditch team during the 1990s. C. Warrington 1989 - 1996 Chaser of the Slytherin Quidditch team from 1993 to 1996; member of the Inquisitorial Squad. Adrian Pucey 1990s Chaser of the Slytherin Quidditch team until 1993. Flora Carrow Member of the Slug Club. Miles Bletchley Keeper of the Slytherin Quidditch team from 1991 to 1995. Terence Higgs Seeker of the Slytherin Quidditch team in the 1980s and 1990s. Urquhart Captain and Chaser of the Slytherin Quidditch team during the 1996–1997 school year. Vaisey Chaser of the Slytherin Quidditch team in 1996. Blaise Zabini 1991 - 1998 Member of the Slug Club. Daphne Greengrass Sister of Astoria Greengrass. Draco Malfoy Prefect, Seeker for the Slytherin Quidditch team, member of the Inquisitorial Squad and later blackmailed by Lord Voldemort to become a Death Eater (defected). Gregory Goyle Beater of the Slytherin Quidditch team from 1995 to 1997; member of the Inquisitorial Squad; became a Dark Wizard in his seventh year. Pansy Parkinson Prefect and member of the Inquisitorial Squad. Theodore Nott Was supposed to be a member of the Slug Club. Vincent Crabbe Beater of the Slytherin Quidditch team from 1995 to 1997; member of the Inquisitorial Squad; became a Dark Wizard in his seventh year. Killed by his own Fiendfyre during the Battle of Hogwarts. Bridget 1992 - 1993 Duelling Club member. Harper 1992 - 1999 Reserve Seeker of the Slytherin Quidditch team in 1996. Mafalda The infamous cousin of the Weasley family who was cut from the books. The fact that J. K. Rowling intended to place a character named Mafalda, a half-blood who was the daughter of a Squib and a Muggle, in Slytherin, suggests that Rowling at least does not view the Slytherin House desire for blood-purity as particularly influential upon the Sorting Hat. Also as Voldemort and Snape are both half-bloods there seems no reason to suspect a racially pure Slytherin. Slytherin students might possess a certain skill in Potions. Harry's two Potions masters, Severus Snape and Horace Slughorn, both belonged to the Slytherin house. However, it is possible that this talent in Slytherin students could merely be a coincidence, as students from other houses at Hogwarts also shared this talent, such as Harry Potter's mother, Lily Potter (nee Evans) (whose skills were shown through Slughorn's many references to her skill in the subject throughout most of Harry Potter and the Half-Blood Prince) and Hermione Granger who were both Gryffindors. Slytherin students also seem to be gifted in Occlumency. Most of the known Occlumens in the books come from Slytherin (namely Voldemort, Severus Snape, Bellatrix Lestrange, Draco Malfoy, and Horace Slughorn). Elizabeth Burke was most likely a Slytherin. J. K. Rowling stated in a PotterCast interview that some Slytherins were among the reinforcements brought by Slughorn during the Battle of Hogwarts. J. K. Rowling stated that by 2017, Slytherin is no longer the pure-blood bastion that it once was. However, its dark reputation still lingers, hence Albus Potter's fears. It is interesting to note that Slytherin is both the first Hogwarts house mentioned in the series (by Draco Malfoy), as well as the last mentioned in the series (by Albus Potter). In early drafts of Harry Potter and the Philosopher's Stone, members of the Slytherin house were known as "Slytherites". Slytherin House was the winner of the first house cup and the third house cup on Pottermore. This page was last edited on 7 July 2015, at 14:13. This text is available under the GNU FDL and may have been adapted from the Wikipedia article about Slytherin (history).